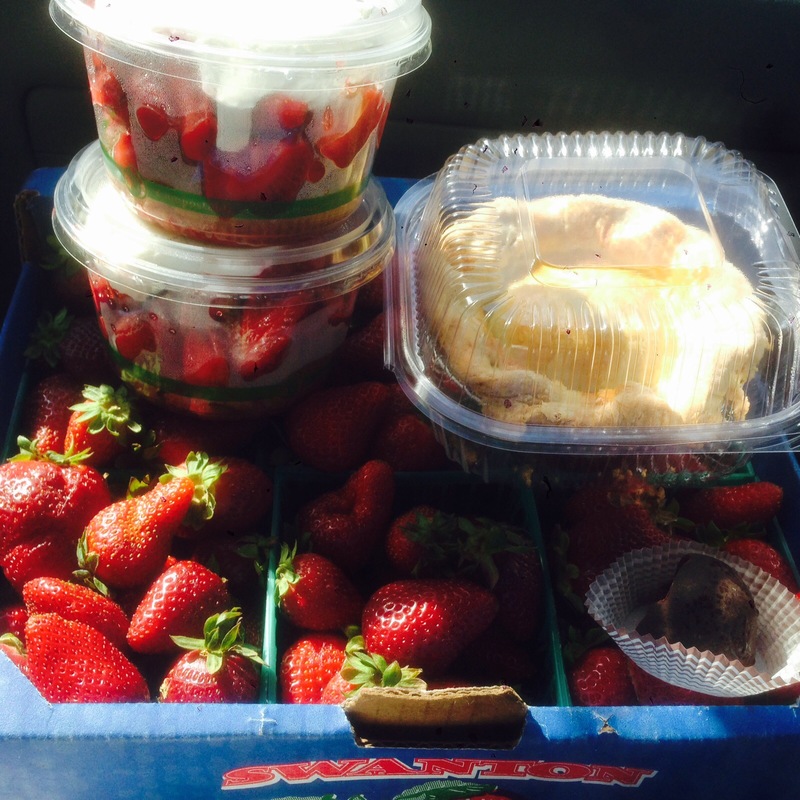 Its strawberry season! The smell of ripe strawberries is intoxicating. I just can’t resist buying a whole flat…weekly! 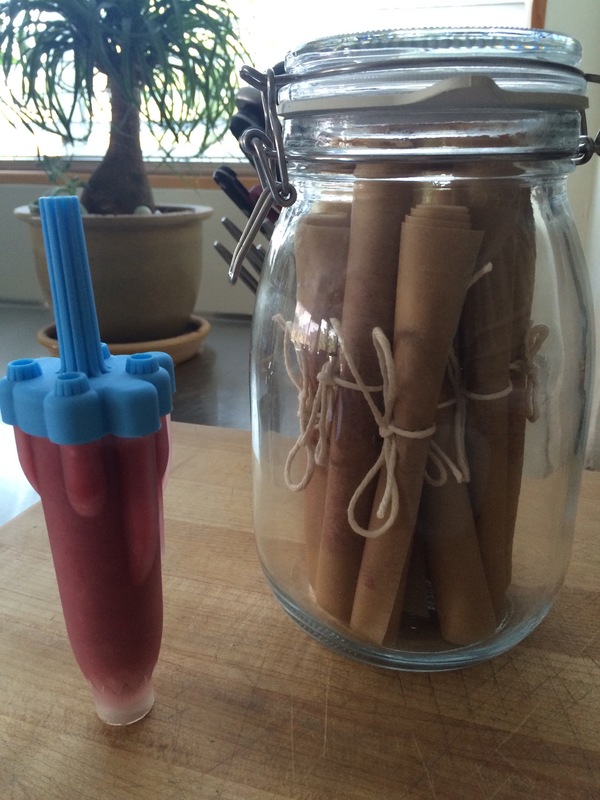 This week’s batch made popcicles and fruit roll ups. 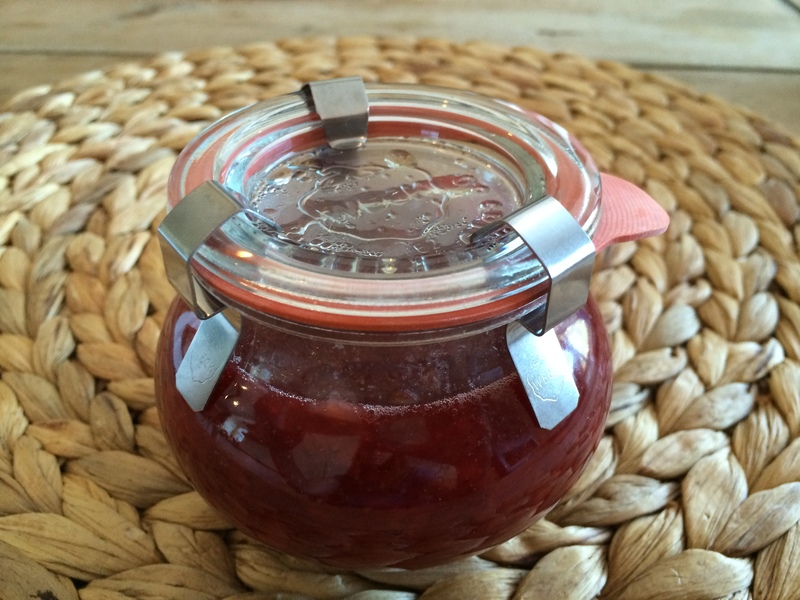 Next week’s will make jam (see last year’s post). Cut off the tops of your berries. Blend them. Pour about 1/2 – 2/3 cup of the mixture on silicon mats and evenly spread across the entire surface. I just tip the mats around until it’s even. The process is super relaxing. (Note: my mats are made for my dehydrator but I’m sure those silicon mats will work too). Then dehydrate on 135 degrees for 3-4 hours or until the center is no longer wet. Pull the fruit off the mat into strips and wrap in wax or parchment paper. Roll them up and tie them with a string. Store in an air-tight container. They should last about a month – though ours don’t last that long because the kiddo loves these tart little snacks. You’ll have mix remaining. Pour them into popcicle molds and freeze. Delicious!! I hate to call these cookies and give you the wrong idea. 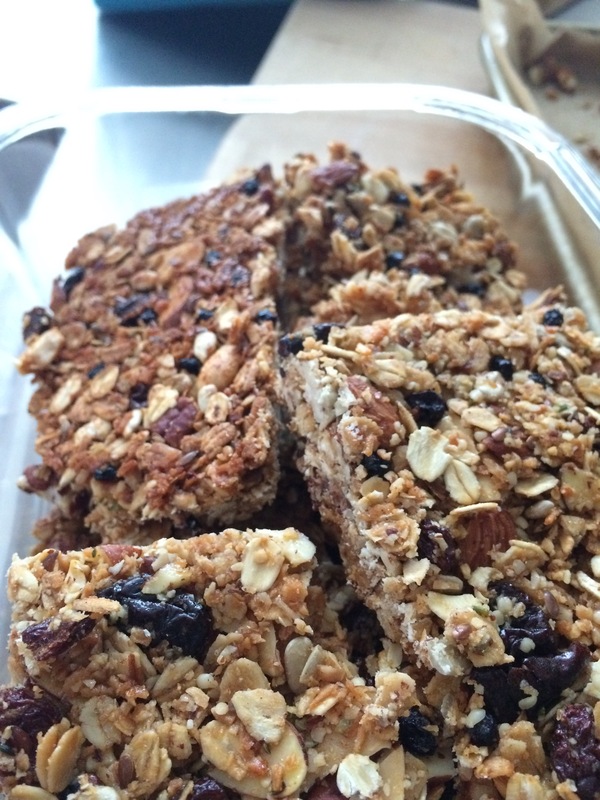 These are not sweet like cookies but more satisfying like a great power bar. They include lactogenic ingredients like oats, hemp seed and nutritional yeast that help with “boobie milk” as my 4 year old calls it. Not that I’m breastfeeding my 4 year old and have no judgement of those that do, it’s just not for me. Her friend just had a new baby and we have one on the way! So, there’s lots of talk about things like poopy diapers and boobie milk. Wait. Have I digressed? Anyway, they’re great for lactating mommies and really anyone who is expending a ton of energy (I’m thinking the cyclists in my life would love these too). Try these bites if you’re expecting or know someone who is. They’re a perfect snack for mommies who are posted on the couch taking care of a newborn. Mix first 10 ingredients. In a separate bowl, mix the wet ingredients. Combine them all together. Then fold in the chocolate chips. Line a baking sheet with parchment paper. 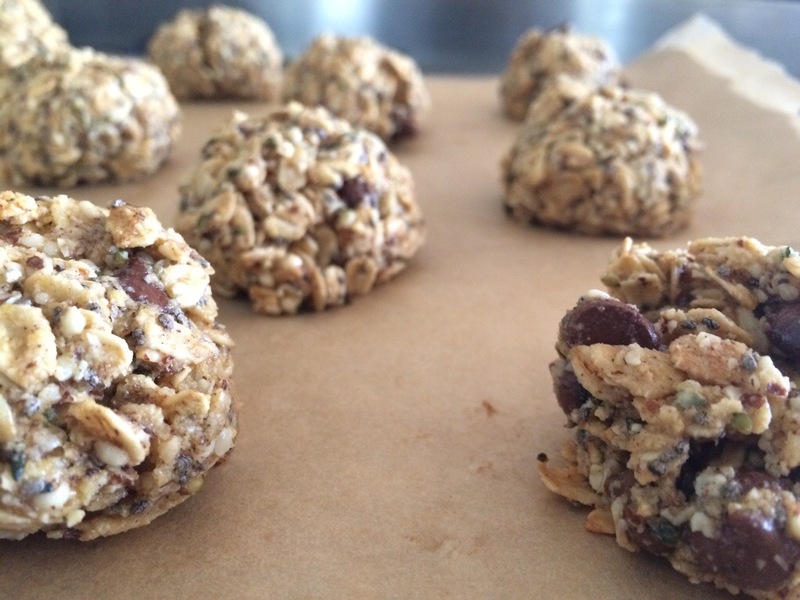 Use a tablespoon to mold the bites into balls and place on cookie sheet ~2″ apart. Pop in the oven for 10-11 mins or until they just start to brown around the bottom edges. Let cool slightly (they’ll be crumbly if you try to move them now). Then carefully remove them from the sheet with a spatula and finish cooling on a rack. Wrap up or freeze remaining bites. It’s getting better, my quest for the perfect slice of banana bread made at home. 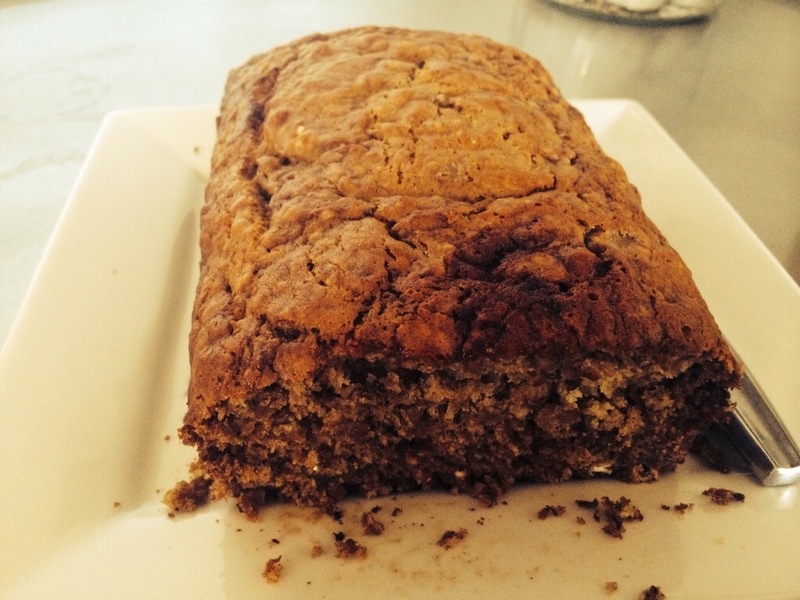 I have a food memory from childhood of a toasty, banana-y, buttery banana bread slice served at my grandma’s house. I’m sure it was store-bought. But I’m on a mission to try to recreate that memory taste. Mash the bananas in a medium bowl. Then add the next 7 ingredients. Mix. Then add the baking soda and salt. 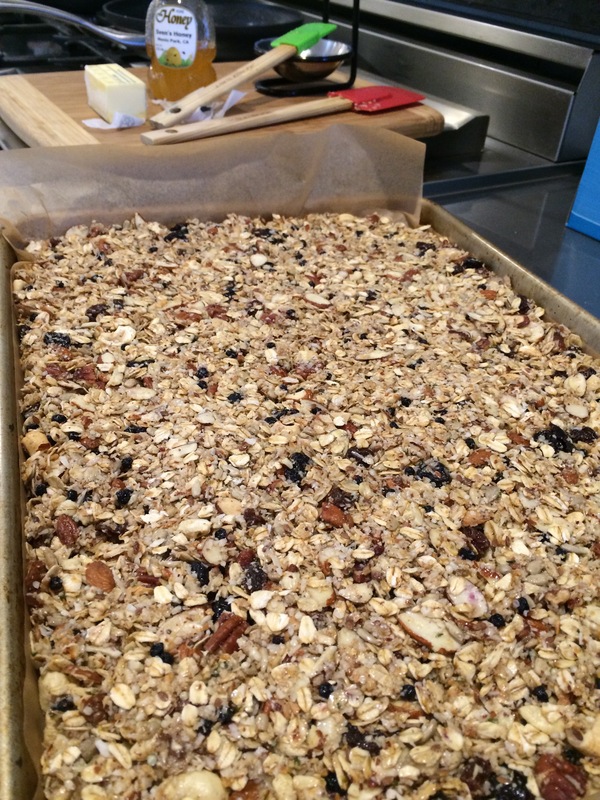 Add the flour and then the nuts and seeds. Bake at 350 degrees for 50 mins in a buttered loaf pan. Make sure to check the loaf with a toothpick. It should come out clean when inserted in the middle of the loaf. Ok, ok. I know. It’s not the season but I’ve been really delinquent in posting and really need to archive this recipe. It’s so damn good! Seriously. Mark this one for next Summer’s jam making extravaganza. In a large deep skillet, add strawberries, rhubarb, sugar, and lemon juice. Heat and stir until it reaches a rolling boil. Boil and stir until it thickens, 10 minutes. When it seems like it is gelling, take your plate out of the freezer. Put a small spoonful of the jam onto the plate and let sit for 30 seconds. Tilt it. If it slides too fast, keep cooking. If it moves slow, it is done. Test every minute or two and do not overcook it. Spoon into heat-proof container and cool to room temperature. Store in the refrigerator for up to two weeks. I froze some and am still loving the fruits of a quick Summer’s bounty boil. My family LOVES snacking. I know – snacking is good for our metabolism but these two could just snack all day and forego a proper meal. Luckily, they don’t. 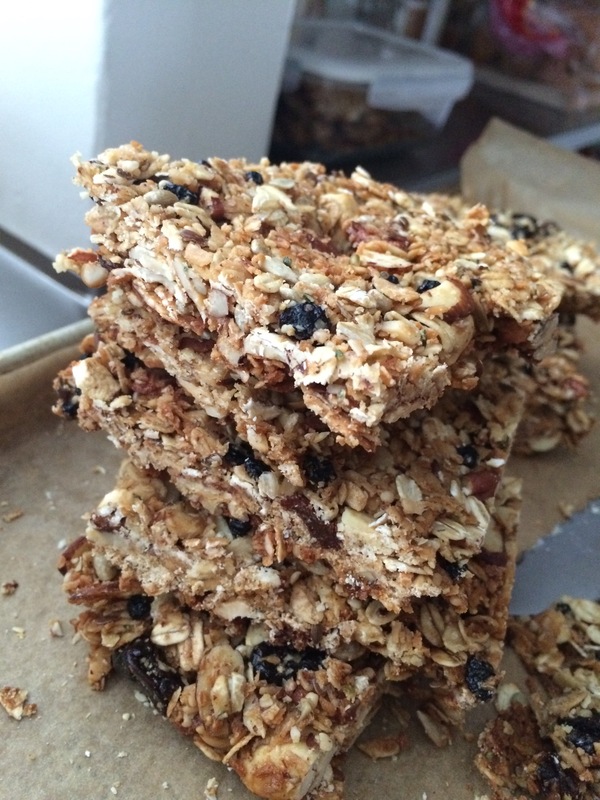 So, in addition to our balanced three meals, I try to make nutritious snacks that they can easily nosh. We are blessed to have a pear tree that gives us abundant amounts of fruit every Fall. We’re in that season. Unfortunately, they ripen really fast. So to preserve them before they end up in compost, I’ve been running the dehydrator nonstop. Cut the lemon in half and squeeze it into the water. Peel the pears. I do them one at a time and then slice and core them. Put the rings into the lemon water so they don’t turn brown. 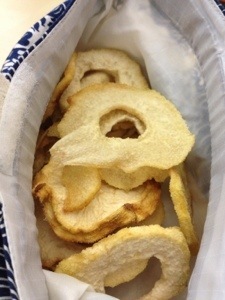 Set your dehydrator to 135 degrees and pack the rings in. Mine took about 24 hours to dry to an almost crispy state. But remember, times vary by climate so start checking your rings around the 20 hour mark. My book club read “Cooked” by Michael Pollan. And while the reviews about the book were mixed, it did inspire me to get cooking again. 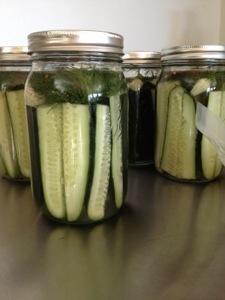 I had intended for us all to make pickles together – inspired by the “earth” section of the book. But too much rosé was consumed and we all ended up lounging in the sun instead. Not a bad alternative. So, the next day, I made pickles. I had my first after 48 hours in the fridge and they are so satisfying! 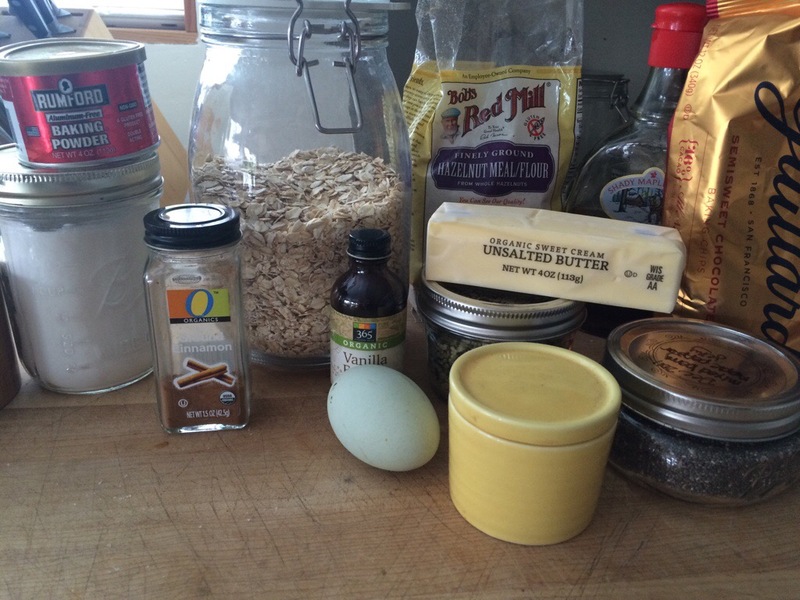 If you’d like to make more than 1 jar (I suggest that you do. I predict that they will be extremely popular. ), just double, triple, quadruple or quintuple the recipe like I did. Wash the cucumbers. Slice them into spears – vertically into fourths. Mine were too tall for the mason jar so I also cut them in half. Pack them into the jar. 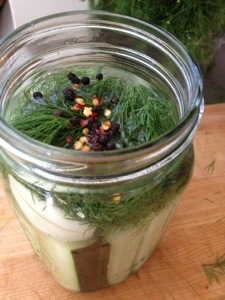 Make sure there’s at least 2″ space between the cucumbers and the top of the jar. And make sure they’re packed in there tightly. In a separate bowl mix the water, vinegar and salt until the salt is dissolved. Add the water mixture into the mason jar. Make sure the water is at least 1″ above the cucumbers. Add in the garlic, dill, peppercorns and flakes. Seal up the jar and put it in the fridge for 48 hours. Pop open the jar and get snappin!